The cosmic microwave background (CMB) provides a snapshot of the universe at a time only 380,000 years after the Big Bang. The well-understood dynamics of the CMB enable precise calculation of its observable features, and directly connect new measurements to fundamental physics. These properties are what makes the CMB one of the most powerful pieces of evidence that we live in a geometrically flat universe, dominated by non-baryonic cold dark matter and dark energy, with large-scale structure having grown through gravitational instability seeded by quantum fluctuations from an earlier inflationary epoch. The next frontier of CMB research is to extract the wealth of cosmological information available from its polarization. CMB observations have always been a sensitivity-limited field of research; advances in detector technology have proceeded hand-in-hand with scientific discovery. Over the last 15 years, CMB detector development has focused on making ever-larger arrays of detectors. Stage-II experiments are currently observing with O(1000 ) detectors, Stage-III experiments are currently under development with O(10,000) detectors, and a Stage-IV experiment (CMB-S4) having at least 100,000 detectors. Towards this goal, scientists at the FCPA have partnered with other national laboratories and university partners, to develop scalable arrays of superconducting transition-edge sensor (TES) detectors for future CMB experiments (see Figure 1). Figure 1: Photographs of a prototype SPT-3G dual-frequency (90/150 GHz) band pixel using a sinuous log-periodic antenna developed by collaborators at UC-Berkeley. The center picture shows the pixel layout including the antenna, one of the four transition edge sensor (TES) bolometers, and associated microstrip circuity. All components of a pixel fit within the footprint of a 6 mm lenslet mounted on the reverse side of the wafer. The antenna connects to microstrip transmission lines (inset on left) which run on top of the metal antenna arms using them as a ground plane. The RF signals are split into two bands by lumped diplexing filters (inset on top) and terminate on a thermally isolated TES bolometer island (inset on the right). SPT-3G will use 95/150/220 GHz three-color pixels. Figure 2: A picture of the South Pole Telescope (SPT) and full moon. 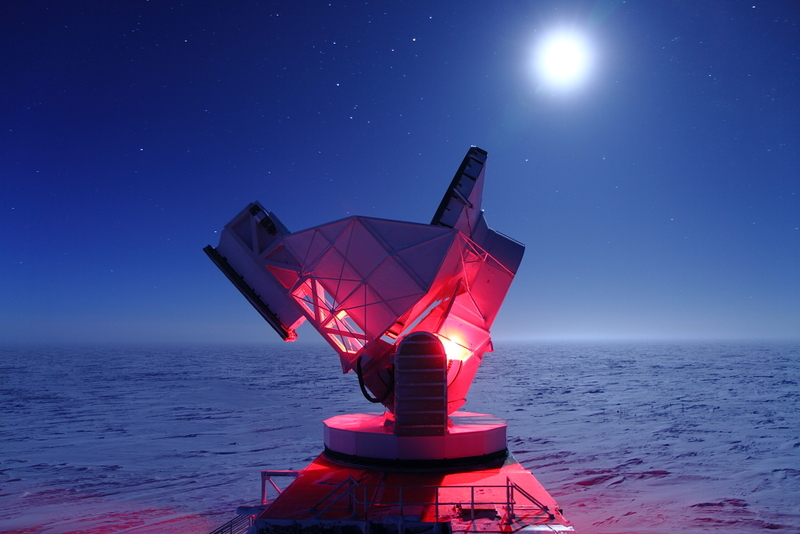 This photo shows the SPT observing during the austral winter, with the featureless horizon of the high Antarctic Plateau in the background. Scientists at FCPA also have a major role in the 10-meter South Pole Telescope (SPT, see Figure 2), and are now working on the construction and integration of its third-generation camera, SPT-3G. The SPT has thus far been used for two surveys: 1) the competed SPT-SZ survey, and 2) the polarization-sensitive SPTpol survey. The SPT observations have led to significant results and new discoveries in four main areas: using the SZ effect to discover new galaxy clusters, the systematic discovery of strongly lensed high-redshift star forming galaxies, measurements of the fine-scale CMB temperature anisotropy, and the first detection of the so-called “B modes” in the polarization of the CMB (see Figure 3). The SPT-3G and CMB-S4 experiments have scientific goals that aim to answer some of the most exciting questions in cosmology and that are at the heart of the high-energy physics mission: to constrain inflationary physics at grand-unified theory energy scales (~1e16 GeV), to measure the sum of the neutrino masses at a level below the minimum mass expected from neutrino oscillations (<0.06 eV), and to precisely constrain the relativistic energy density of the universe and any “dark radiation” component. Figure 3: The first-ever detection of the “so-called” B-modes in the cosmic microwave background (CMB) by the SPTpol experiment. The black bars show the cross-correlation of the gravitational lensing B-modes measured by SPTpol at 150 GHz with a prediction inferred from cosmic infrared background fluctuations by Herschel and E-modes measured by SPTpol. The green bars are the same as black, except using E-modes measured at 95 GHz by SPTpol. Orange bars use an alternate B-mode estimator. Gray bars are a null test using the SPTpol data. Dashed black curve is the prediction for the lensing B-mode spectrum in a fiducial cosmological model. American Museum of Natural History video describing the South Pole Telescope, and its current camera SPTpol, which is measuring the polarization of the CMB.